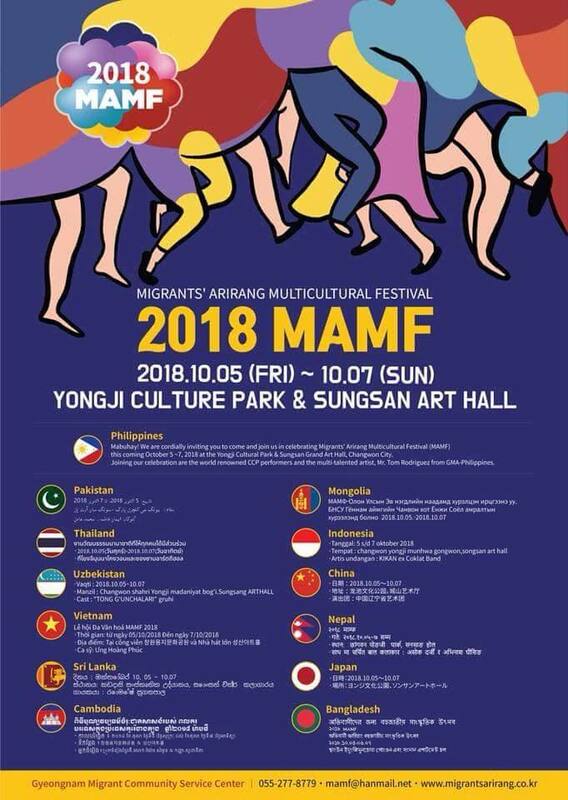 The Embassy of the Philippines invites all Filipinos in South Korea to join the 2018 Migrants’ Arirang Multicultural Festival (2018 MAMF) happening on 05 to 07 October at the Youngji Cultural Park in Changwon City. This event, hosted by the Gyeongnam Migrants Labor and Welfare Center and supported by the Ministry of Employment and Labor, Ministry of Culture, Sports and Tourism, Changwon City, Gyeongsangnam Province, and the Gyeongsangnamdo Office of Education, is the largest multicultural festival in the whole of South Korea and is expected to be attended by over 10,000 Koreans and foreign migrants. 2018 MAMF is significant for us, Filipinos, as the Philippines will be the featured country. As the featured country, you will all be able to enjoy the best of Filipino culture and talent from celebrity artist, Mr. Tom Rodriguez, as well as renowned cultural groups from the Philippines, the Lahing Batangan Dance Troupe and the Song Weavers Philippines. Additionally, you will also get to enjoy cultural shows from 12 other EPS sending countries (Pakistan, Mongolia, Thailand, Indonesia, Uzbekistan, China, Vietnam, Nepal, Sri Lanka, Japan, Cambodia, and Bangladesh). The main organizers of the 2018 MAMF will also be providing free shuttle bus from Seoul to Changwon. To avail, kindly send an email to Ms. Anna Sumayod at mrasumayod@gmail.com. Come and be one with us as we celebrate cultural diversity. Display your national pride and lend support to this worthwhile event.